Thanks so Magically much for your Positive observations and welcome Honesty. It was Wonderful for all of us to be out on our bikes on another Glorious sun filled day! I remember you mentioning you were taking the boys for sushi, after your pleasurable pedal around the seawall. Kaelin and I eat vegan raw sushi made of undyed ginger slices, beets, sun roasted nori and various Delicious herbs and spices. Your tempted taste buds will never know the difference. Yet, your hungry (to be fed proper live enzymes nutrition) body/mind and energy level surely and Wondrously will! 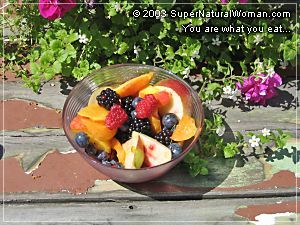 Have you been looking at my http://www.SuperNaturalWoman.com website recently? I've introduced my advice column - Supernatural You - please check it out! When you ask me, "are you into Nutrition?" more than that... I am chock chick-full of Nutrition! Life is a constant renewal, consisting of continual cleansing as we replenish the Amazing World that lives, breathes and miraculously multiplies within us. Our only work is to Let Go - in order to refill with the appropriate fuel. This is how this Supernova Divinely does it! Are you aware that all dreaded dis-ease begins in the intestinal tract? It's not what you consume, it's what you digest! Next... to excrete. Time to clean up your first act, 'cause you don't want this Supernatural show to end before it's midway mark! Get off the meds and introduce some friendly (as well as trusted holistic guidance) 'good' bacteria to assist in wiping out the damage incurred by an unconscious system that is slowly and insidiously 'feeding off' of you! Since you certainly wish to achieve the most effective long term results, I sincerely recommend you re-start with a clean and refurbished vessel. It's actually very simple. A little time, (after all it is already yours) and a lotta trust and 'Self Love' will get you to the desired destination of complete Health and Happiness you are entitled to! Today is the day to start listening to your Inner Voice and to put aside fear mongering casually cast forth from a paid professional who gives you a death sentence as a gift of a doctorly diagnosis. Unless you sadly pay even more for your 'bodily sins' through your open and proffered wallet. Why not assume total Responsibility of your Luscious Life and become Pilot (no co-conspirator) of your own Starship? Besides, it's a much more Exhilarating, Liberating and Life Enhancing Journey! So, Ride like the Wind! You are a Living, Loving, and Vital part of Nature. You are foremostly intended to Shine like the inexhaustible and inextinguishable Sun, itself! I look forward to helping support and assist you in ensuring that you are soon firmly and finely in your Supernatural Saddle! P.S. If you choose to expedite this reality shift necessary for the Healing of your one and only self, I wisely suggest you contact me and we continue a rapid regrowth of your Health, through a Supernatural Series of Creative and Consciousness Raising Consultations. Before all (not after...) your own Shining Son deserves it. Imagine, what an even more Rawsome Role Model (a literally Glowing example) one Happy (and Home Free) Dad shall Forever Beautifully Be! Please send $20 contribution to Katherine for a personalized response, replete with pics of Supernatural Woman. Do'n It - Like She Tells It!